Uber is hiking its fees in Hong Kong for its ride-sharing service, with the company introducing a new booking fee and an increase to its minimum fares due to “an evaluation of the marketplace” in Hong Kong. Uber will also introduce a booking fee of HK$5 to all rides, which will help cover administrative costs. For uberX and uberASSIST, the minimum fare is going from HK$25 (Kowloon and New Territories) or HK$30 (Hong Kong Island) to HK$40. 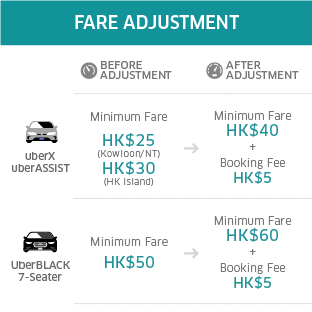 For UberBLACK or 7-seater, the minimum fare will be raised from HK$50 to HK$60. The changes come into effect from today (21 August). “We are committed to continue our investment here in Hong Kong, to ensure a seamless Uber experience for both riders and driver-partners, and to provide a safe and reliable choice of transportation for Hong Kongers,” Uber said in a statement. The story was first reported in Marketing-Interactive.com. From tech futurists to fashion gurus, these young leaders have a net worth of at least $3 million. Feeling unsuccessful yet?..